If you’re woke to a modern rebranding of some fly 70s style, then we support you in turning yourself into a real cool cat with this Big Daddy Pimp Plus Size Costume. 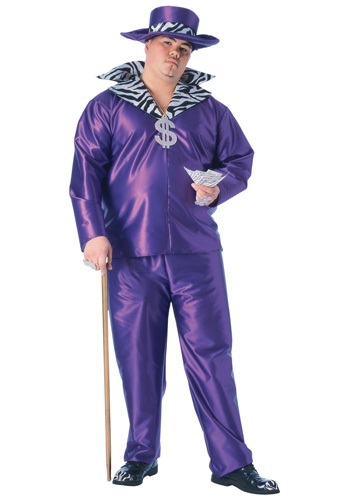 So hip its fly, this 100% polyester costume features a purple one-piece jacket with a zebra-striped foam collar and matching purple pants. It even comes with a large purple hat with a zebra band on it! The jewelry, cane, and prop money we have it pictured with are sold separately. If you want to add some other key accessories, too, like high-heeled boots or some large dark glasses, we've got them all available to further accessorize the style. We are your one-stop costume shop, after all! Pick out this style and some key add-ons, and you too will be ready to hit the streets. With the help of your creative costume companions, of course!